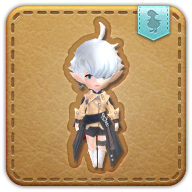 Summon your dress-up Alisaie minion. Now 120% more discernable from the wind-up Alphinaud minion. After finding that she could simply not tell her wind-up Alisaie and Alphinaud automata apart, Tataru went about modifying the former's garments, creating something both new and bold...all while keeping manufacturing costs at an absolute minimum! Increases action party ATK by 40.